Watercolor Quilting for your Summer Fun. What are you doing with your summer? I've been working on a little watercolor quilt and thought I would share with you what I've learned. 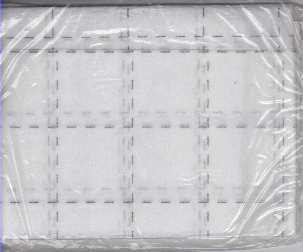 Once you have this grid made in 2 inch squares on fusible non-woven fabric, lay the 2-inch squares in place and press with the iron according to the instructions for the fusible web fabric. Now that all the squares are attached to the fuse fabric, you can flip it over and sew 1/4 inch seams horizontally and vertically to make 1 3/4 inch squares with perfect intersecting seams. Impress yourself! Have some fun with something you didn't know you can do. Make something out of nothing--2-inch scraps are throwaways to most seamstresses and many quilters. You can make a pillow in no time. Do you sew but haven't tried quilting? It's easy for you to make the transition. 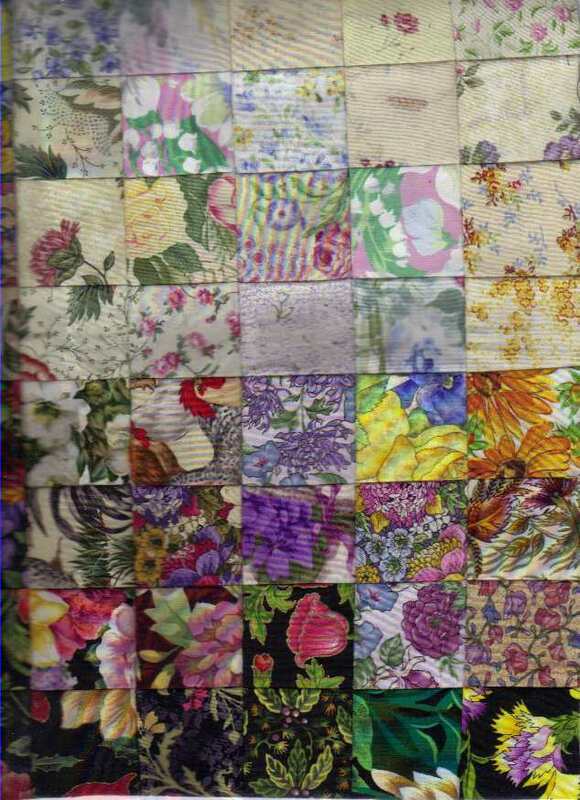 Use this method for charm quilts, too, where every square is a different fabric. Just fuse the squares from the front, turn to the back and stitch 1/4 inch seams horizontally and vertically, and the piece is completed. Rick rack has been around since I was young, and that was a long time ago. In the 50s it was used for decoration on aprons and dresses as well as for crafts. Now that rickrack is back for crafts and crafting, you probably still have some in grandma's sewing box. No need to waste. It is still just as good as it was the day grandma used it on your sun bonnet, if it hasn't faded from sunlight. No wonder the sewing box is made of wood or a good light-proof product--it protects these fun crafts items for the next generation. Rickrack braid is a double-duty product that works for hand-made purses and embellishments for tote bags, little girl's jeans and any number of crafts projects. It is easy to make and will use up the rickrack. The process is so easy, the kids can help. 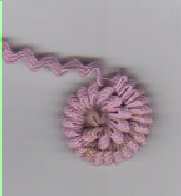 Braiding rickrack can be done with two or three strands of rick-rack, and the finished length will be only slightly shorter than the starting length. Rickrack makes great flowers for crafts or ribbon embroidery, and you can also make flowers to match the rickrack braid. Once the flowers are made, the rickrack no longer looks like zigzags. This project takes some hand-sewing--just in and out running stitch--and the kids may be able to help with this, too. Lots of home-school teachers look for children's crafts, and hand sewing is ideal for the 6-to-12 age group. Have some fun with rick rack crafts! See you soon with more needlework crafts, sewing and stitching fun. Sewing skills can last a lifetime, and you can sew with any level of ability and knowledge and still make it worthwhile. If you have a sewing machine that you haven't used for years, get it out and dust it off. With the internet at your fingertips and the sewing machine at your command, you can learn to sew with little effort. Do your own repairs and alterations and save money and save the environment. Every item you repair is one you do not have to buy new and one that does not go to the landfill. Much sewing is as simple as stitching a torn seam or hemming a pair of jeans. A sewing machine can save you money if you throw items away that need a minor repair or alteration, or if you want to make curtains or bedding for the home. My sewing machine cost $200 in 1975, and has been used for 35 years to make children's clothes, home decor and thousands of repairs. There is an emotional reward of accomplishment in sewing, whether it is for repairs or crafts, quilting or making a new dress or robe. If you have never had time to sew, take the time now and use it as a therapy. It is much cheaper than the price of a therapist and you can stay at home to do it. 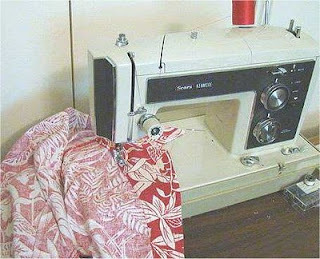 Dust off the old sewing machine and fix it if it doesn't work. There is very little that can go wrong with a sewing machine that you cannot repair yourself. Almost anything you need to know about sewing is available online now. Whether you already know how to sew or have always wanted to learn, make sewing fun, save money with repairs to clothing and home decor, and find therapy in the emotional rewards. Well, summer has reached Texas and we are into 100-degree weather. I like to sew but it is too hot to work with a full-size quilt, so it is time to make miniatures or a quilted pillow. 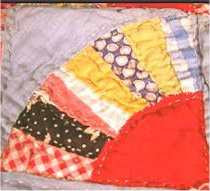 A doll quilt is the perfect size at about 18 by 20 inches, and it will use your tiniest scraps. A pillow is about the same size and both of these projects can be take-along if you want. Doll quilt blocks are small copies of a full-size quilt block and should be about three inches square. Make a pattern and a sample block before cutting all the pieces. 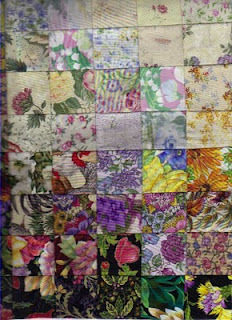 A doll quilt can be made by hand or with the sewing machine with completion planned for the end of the summer when heavy fabrics are more appealing. Sewing doesn't have to stop with weather changes; just adapt your sewing to the weather. See you soon with more stitching and needlework crafts.